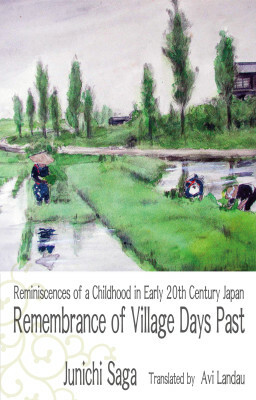 Renowned for his ability to bring the past back to life through his works, Dr. Junichi Saga takes us this time to the Japanese lakeside hamlet of Yamauchi (now in Miho Mura, Ibaraki Prefecture), where his father had lived for several years as a child in an old thatched-roof farmhouse, teeming with family, friends, and for much of the year- seasonal workers. Weaving together his father’s richly detailed reminiscences, the author recreates for us a Japan that has all but vanished, presenting a moving and often very funny human drama, as well as an ethnographic-folkloric treasure trove. Despite the separation in miles and years, readers will surely feel a closeness to the remarkable little boy whose story is told here. A must read for anyone interested in getting to know the REAL old Japan – just as it once was. In June of 1913, Father left me and my mother – heavy with child at the time, and went off to Russia. I was two and a half years old. On the day of his departure, Mother took me along with her to Tokyo Station for the “send-off”. Some other people had come for the same purpose, among them a young woman – pretty, fair-skinned and petitte, whom I later found out was Father`s mistress. Once he had found his seat on the steam-train, Father opened the window and sat down, resting his elbow on the window-sill. He was wearing a grey suit with a tie, and sported an impressive, black mustache. His big, thick lips were pressed haughtily together, not conceding even the slightest hint of a smile. Mother remained silent the whole while. The young woman, standing apart from us, said not a word. With his elbow still on the window-sill, Father raised his fore-finger ever so slightly ( a restrained wave?) – and with a sudden “CLACK”, the steam engine set into motion. Then, just like that, the train started pulling away. I didn`t feel the least bit sad. In fact, I was not even conscious of that person being my father. We stood there “seeing him off”, until his train had faded completely from view. I don`t remember there being any tears in Mother`s eyes. For a long time after that I had no inkling why Father had gone and left us. But meanwhile, Mother had taken me back with her to her parents` house in the Yamauchi district of Anju, her home-village, where not long after, she gave birth to my little sister. Then in the spring of my seventh year, Father suddenly came home. The mustache that surrounded his lips had grown grander – and the look in his eyes had turned cold as ice. Mother was hoping to at long last live together as a family. But alas, Father had other things on his mind. He planned on staying in Japan only temporarily – in order to stock up on medicines and medical supplies to take back with him to Russia. Hearing that he was planning to return to the war-torn continent.nearly drove Mother to despair – and what she did took Father by complete surprise. She insisted that all of us – the whole family – go abroad together. Even now I`m not sure why, but Father eventually relented, and agreed to the idea. Life in Russia, more specifically in Irkutsk in Siberia, where Father had opened a clinic, was like nothing we could ever have imagined. The things that happened to us there are recorded in a book called “HYO-SESTSU NO BAIKARU” (The Frost and Snow of Baikal), which has been released in English as “Susumu`s Saga”. What happened was that eventually, the revolutionary forces gained the upper-hand even in Siberia, and this time, it was Mother, my little sister and I, who ended up leaving Father behind, as we returned to Japan. For several years we survived (once again) by depending on the good graces of Mother`s relatives back in her home-town. Even as a child, though, I could not help but sense how emotionally difficult it all must have been for Mother. That is why I cannot help but feel a bit guilty when I say that I have many pleasant memories of that time. 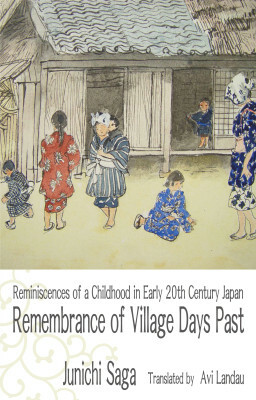 But it`s true – memories of those “village days” live on freshly in my mind, in vivid color of special hue. Especially the things that happened to me over a five-year period – from when I was two to seven years of age. Without knowing why, certain episodes and scenes appear before my mind`s eye, like mold on a lab-slide, and linger there till they fade away. And not only sights, but sounds, as well – the babbling of a brook, the singing of a bird… I can still hear them from time to time in my “mind`s ear”. I have long wanted to take these accumulated memories, enfolded deep in the recesses of my mind – just the way they are – and put them down on paper in all their detail. Not just out of sentimentality, mind you, (nor as a mere exercise in memory), but as a kind of archaeology, a gentle peeling away of each mnemonic layer, to reveal not only things – but a way of living, thinking and feeling, that once existed everywhere – but cannot be found anywhere today. By Junichi Saga (translated by Avi Landau). You can read the rest on your Kindle ( smart-phone or computer) here.